Written by: Kent A. Varmedal, Henning Klevjer, Joakim Hovlandsvåg, Audun Jøsang and Johann Vincent. To be presented at The 7th International Conference on Network and System Security (NSS 2013), Madrid, Spain (3rd and 4th of June 2013). Written by: Henning Klevjer, Kent A. Varmedal and Audun Jøsang. Presented at IFIP IDMAN 2013, Royal Holloway, University of London, UK (8th and 9th of April 2013). Presented at SAR-SSI 2012, Cabourg, France. ISBN 978-2-9542630-0-7, Cabourg - France, 2012. 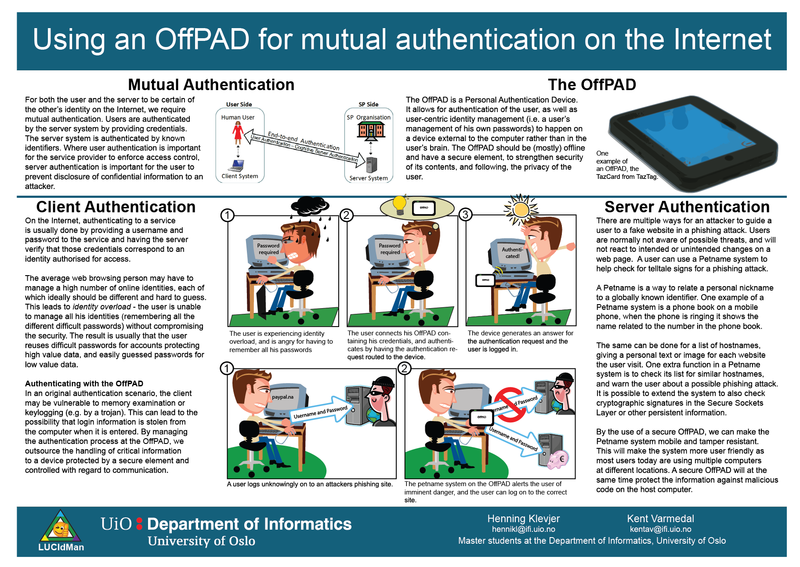 My Master's thesis on device based automatic authentication. Written by Kent A. Varmedal and Henning Klevjer. Presented at NordSec 2012, Karlskrona, Sweden. Excerpt from my 2013 Master's thesis.